Utah is a state in the United States. It became the 45th state admitted to the Union on January 4, 1896. Utah is the 13th-largest, the 33rd-most populous, and the 10th-least-densely populated of the 50 United States. Utah has a population of about 2.9 million, approximately 80% of whom live along the Wasatch Front, centering on Salt Lake City, leaving vast expanses of the state nearly uninhabited. Abraham Lincoln, Edward Tullige in "History of Salt Lake City" (1886), p. 697. Wilderness and the life dependent on it are fragile entities. They can be destroyed in a matter of years, if not days. Legislative protection is the surest way to maintain a wilderness reserve on our hungry and crowded planet. When wilderness is protected, watershed is protected. Biological diversity is protected. Game is protected. The proper functioning of a natural system is protected. Our quality of life is protected. Wallace Stegner, Mormon Country (1982). The Utah deserts and plateaus and canyons are not a country of big returns, but a country of spiritual healing, incomparable for contemplation, meditation, solitude, quiet, awe, peace of mind and body. We were born of wilderness, and we respond to it more than we sometimes realize. We depend upon it increasingly for relief from the termite life we have created. Factories, power plants, resorts, we can make anywhere. Wilderness, once we have given it up, is beyond our reconstruction. Wallace Stegner, Wilderness at the Edge (1990), introduction. 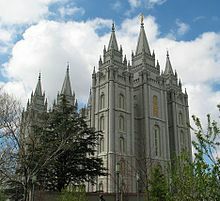 In 1849 the Mormons organized a "free and independent" government and erected the "State of Deseret," with Brigham Young as its head. But the very next year Congress deliberately snubbed it and created the "Utah Territory" out of the same accumulation of mountains, sage-brush, alkali and general desolation, -- but made Brigham Governor of it. This page was last edited on 22 March 2017, at 18:20.